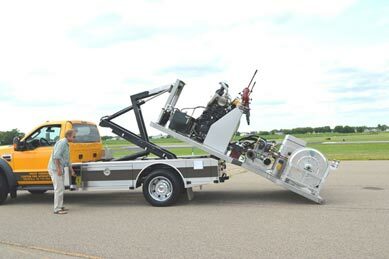 Powered by a diesel engine, RatioResponse incorporates an AccuMax “flow-based” hydraulically-driven, electronically controlled, foam concentrate proportioning system. 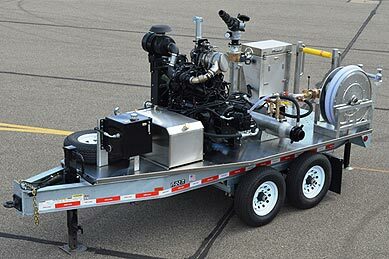 Available with a 40, 60, 90, 150, or 300-GPM foam pump capacity, and proportioning ratios of 0.1 to 10%, AccuMax can accurately deliver foam concentrate for waterway flows ranging from 1000 to 10,000-GPM. Due to the flow-based system design, the incoming waterway pressure need only be enough to feed the downstream device(s), be it a Standpipes, fixed Monitors, or a Booster Pump. Flow rates of water and concentrate are digitally displayed, both as current flow and accumulated totals. In addition, RatioResponse is available with a single or multiple waterways, the latter being provided with independent injection points; each with its own variable concentrate ratio. 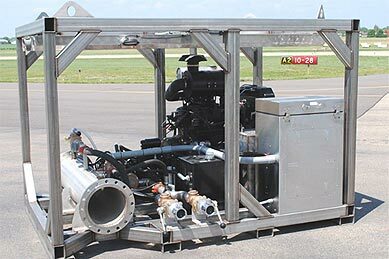 Optional Enhancements, available on all models of RatioResponse, include: enclosed cabinetry, engine heat shield, single or dual high-flow Monitors, inlet and outlet Gate Valves and special Fittings, waterway Pressure Relief Valve, Low-Flow for hand line operations (Multi-Point only), Manual Override, Suction Hose Reel(s), and on-board Dry Chemical Vessels.